Located in the foothills between Big and Little Cottonwood Canyons, this four-bedroom Cottonwood Heights vacation townhome has room for up to 12. There's even a private hot tub for extra relaxation during your getaway! From here, you are just 26 miles from Park City and only about 15 miles from Salt Lake City. This is the perfect location whether you want to ski, hike, shop, or just hang out at home and soak in the hot tub. Inside your Salt Lake City area retreat, you'll enjoy a contemporary and comfortable design with leather furniture, AC, WiFi, cable TV, and Netflix streaming. There's also a private washer/dryer so you'll have no need to overpack for your stay. 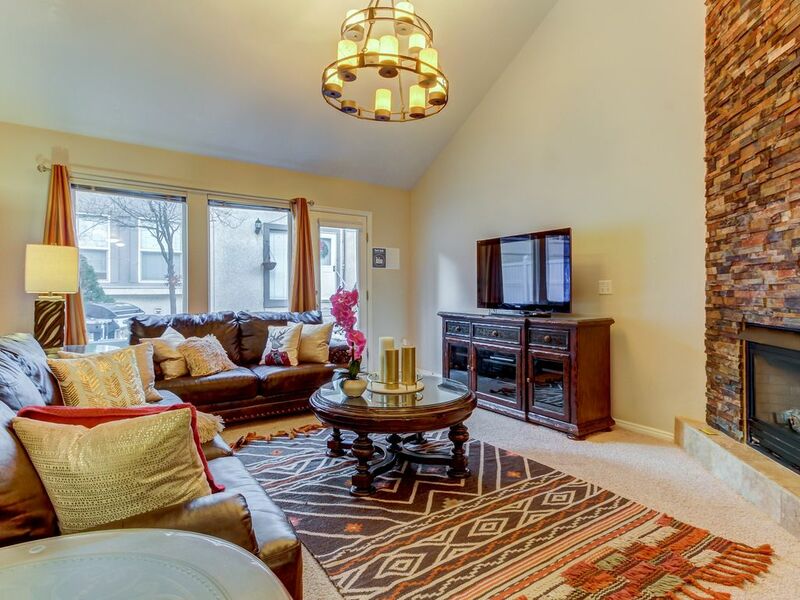 This spacious townhome has a fully stocked kitchen with all major appliances, dining room table, and a breakfast bar. At night, the four bedrooms provide space for up to 10 guests, and there is a maximum occupancy of 12. The master bedroom has a king-size bed and in the three other bedrooms, you'll have two queens, and four twins. If you do have 12 guests, there is a queen air mattress also available so everyone has a comfortable place to sleep. Additional amenities include an additional living area downstairs, a jetted tub in the master bathroom, deck, patio, and an outdoor gas grill. For a fun getaway with family or even a friends' retreat, this Northern Utah vacation townhome will have your whole group well-rested and ready to explore the Beehive State! Parking Notes: Parking must be confined to garage and driveway only. No on-street parking is permitted. Super convenient. Clean. Very user friendly. Has it all for a ski trip to the cottonwood canyon ski areas. Can’t wait to return. Vacasa worked very well for 4 adults and 5 kids. We loved the kitchen, hot tub and proximity to the mountains. The house was perfect for both of our families! 5 full bathrooms were great! Really enjoyed the big open kitchen & large island! Will definitely stay here again! We had a wonderful time over Christmas break at this condo. With 9 people, the five bathrooms were AMAZING -- no one was ever waiting for a shower! The kitchen is fantastic: well stocked, with a lovely island that allows for the family to gather while the cooks are cooking to socialize and hang out. The dining table accommodated everyone. There are two TV rooms, so no fighting over what to watch, and the hot tub felt great after a long day of skiing. Maintenance was incredibly responsive when we had trouble getting the gas fireplace on. You won't go wrong with this place, especially with a large group!